'THE LOUDER he talked of his honor," wrote Ralph Waldo Emerson in 1860, "the faster we counted our spoons." As a resident of Massachusetts, Emerson knew better than to take at face value anything public officials say about their own rectitude. That was a prudent attitude a century and a half ago. It's just as prudent now. In the long-running saga of Beacon Hill pay raises, underhanded maneuvering has been the norm. So when Beacon Hill created a high-powered "advisory commission" to evaluate the salaries paid to top elected officers and lawmakers, only a naïf could have doubted it would come back with anything but a recommendation for hefty pay raises all around — and pitch that recommendation as a matter of fairness, honor, and good government. Huge increases in what are already among the highest salaries paid to legislative leaders and statewide officials in America, concluded the commission in a report released Monday, is the best way to attract "publicly spirited and honest individuals" to state government. More lavish paychecks will "ensure that there is not a temptation to betray the public trust." News stories have focused on the commission's call for hiking the governor's total compensation by nearly $100,000 a year, and boosting the six-figure salary of the House speaker and Senate president by more than 70 percent. Since governor-elect Charlie Baker says he would "probably veto" any such legislation, the Legislature may try to get the pay hikes passed before Baker takes office in January. But the biggest affront in this plan is the element that has drawn the least attention: the commission's unlawful scheme to engineer a raise for rank-and-file legislators. 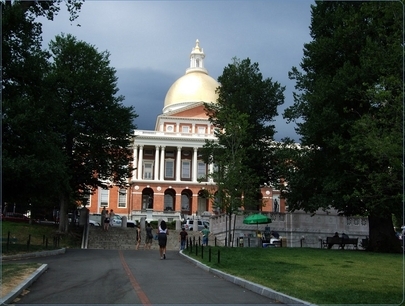 In the long-running saga of Beacon Hill pay raises, underhanded maneuvering has been the norm. Late at night on Halloween in 1979, lawmakers rammed through a bill hiking their pay with no public hearing or advance notice. Three years later the Legislature returned to the trough, attaching a 50 percent raise for its members to a judicial pay measure, which couldn't be blocked by referendum. In 1987, another ploy: A sizable (and retroactive) legislative salary increase was passed with an "emergency preamble," which made it effective immediately — and immune to repeal until it was nearly two years old. In 1994, Governor William Weld — days after claiming that still another pay hike was "not something we're considering" — colluded with legislative leaders to pass a bill enlarging the salaries of House and Senate members by a stunning 55 percent. Time and again, Beacon Hill politicos have justified such avarice by lamenting that they had no better option — that there is never an acceptable way for elected officials to give themselves a raise. But then they devised one: They would put a cost-of-living adjustment for legislative salaries right into the state constitution, and forswear forever the right to vote on their own pay. In 1998, Massachusetts voters were invited to approve a proposed constitutional amendment that would, once and for all, put the issue to rest. "A Yes vote would prohibit state legislators from changing their base pay," explained the official voter guide, "and instead would adjust that pay according to changes in median household income." Voters agreed. The amendment passed handily. Massachusetts lawmakers looked forward complacently to receiving automatic biennial raises as a constitutional right, forever. And sure enough, their salaries went up by a few percentage points every two years, in keeping with the amendment's explicit formula adjusting legislative pay in tandem with median household income. Until median household income stopped going up in the wake of the Great Recession. 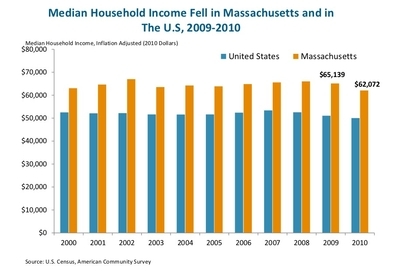 In the wake of the Great Recession, median household income in Massachusetts declined slightly. That meant legislators' salaries were slightly reduced — though they remain among the most highly paid state lawmakers in the country. In 2011, legislative base pay was trimmed by 0.5 percent. In 2013 it dropped by another 1.8 percent. After a decade of scoring regular raises without having to do anything to justify them — hey, it's in the constitution! — the Legislature was suddenly confronted with the reality that salaries can go down, too. But that's not a reality every lawmaker is prepared to accept. And — surprise, surprise! — their "advisory commission" says they shouldn't have to. The panel recommends a new method of calculating changes in Massachusetts state income, one that relies on statewide income data "in the aggregate, not the median." That may sound boringly technical, but the bottom line is crystal-clear: The commission's recommended method would have raised legislators' pay in 2011 and 2013. But aggregate income isn't what the constitution specifies. The amendment drafted by the Legislature — and approved by the voters in a landslide — made "median income" the touchstone. It forbids lawmakers from voting for anything else. Beacon Hill, for once, has been hoist with its own petard. Assuming, that is, that in Massachusetts, the constitution rules. Does it?